Posted in News on January 15, 2019 by Brandon Costa. 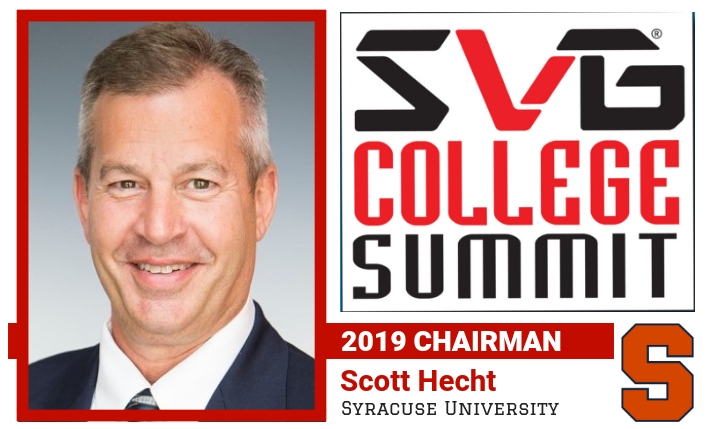 Scott Hecht, senior producer, Syracuse University Athletics, will serve as chairman of the 2019 SVG College Summit to be held at the Omni Hotel at CNN Center in Atlanta on May 29-31. As chairman, Hecht will play a critical role in providing guidance on the content of the event’s agenda and assist in filling the lineup of speakers. REMINDER: All qualified attendees pay no registration fee! Hecht boasts more than 30 years of experience in broadcast production. He joined the Syracuse Athletics production department as senior producer in July 2017. In this role, he is responsible for leading the athletics-production unit, including all ACC Network productions. Last July, his role expanded to include supervision of the creative services department. Prior to joining Syracuse Athletics, Hecht was manager of university productions for the ESPN/SEC Network in Charlotte, NC. His duties included leading, teaching, and mentoring development of concepts and editorial themes for all ESPN remote productions. He was coordinating director for studio directing for numerous shows — including SportsCenter, Baseball Tonight, Sports Reporters, Mike and Mike, and The Herd —from 2008 through 2010. He joined ESPN in 2006 as coordinating producer for studio production and worked with the SportCenter and Baseball Tonightshows. For a peek at the what the SVG College Summit is all about, take a look at the highlights from last year’s show. For more information regarding the SVG College Summit, visit www.svgcollege.com. You can also follow the event on Twitter using @SVGCollege and #SVGCollege.